Thoughts, comments and reviews about various pieces of hardware I get in my hands. And outside of WebOS (lucky that I didn’t go down that path), I’ve been intrigued by the Windows Phone 7 OS since its launch just over a year ago. But the first iteration of the OS was too rough around the edges, and the lack of great hardware got me to stick with iOS until now at least. During a recent trip to the UK, I decided to get myself a Nokia Lumia 800 running Windows Phone 7.5 (Mango) and I have to say that outside of a few little details (see below), I am really impressed by this device! Well, the laptop is now available in its standard form (the custom built ones will be available in about a week) and I decided to go on a field trip to the nearest Sony store to have a look at it. And after playing with the device in the store, I “borrowed” one for a few days before ordering the custom one (I was upfront about that with the sales guy at the store)… and I have to say, this is one impressive little high-end laptop. How to improve eBook readers? Having used a Sony eBook Reader for quite a while, I wanted to share some ideas on how to improve this device and potentially other eBook Readers. All the comments in this post are related to the PRS-505 (the device I have) with the firmware 1.1, but from what I can tell, other eBook readers don’t have these available (nor do eBook apps on the iPhone for example). And for those who will comment asking why I am not using a Kindle from Amazon, I live in Canada and it isn’t available outside of the island called USA (yet). In a nutshell, I still prefer to read books / documents on paper, but the geek toy solution works quite nicely. The main reasons are, in no particular order: DRM, geo-specific content, no way to flip through pages and no way to annotate / highlight the text you are reading. Continue reading How to improve eBook readers? Posted on Sunday, March 8, 2009 Monday, January 4, 2010 Categories hardwareTags ebook, feature request, improvement, reader, sony1 Comment on How to improve eBook readers? As a follow-up to my previous post where I looked at the costing for data plans on Rogers in Canada for iPhone users, I needed to update the information based on the latest changes and limited time offers. For those who follow me on Twitter already know, I got myself the iPhone last Friday (that was fun). Just before the launch, Rogers announced a special time limited data plan at CA$ 30 for 6Gb of data per month, that could be added to any voice plan you wanted. There has been a lot of commenting, discussions and complains about the price plans that Rogers / Fido are offering for the 3G iPhone in Canada. The Ruined iPhone web site is an online petition for Rogers to revise their monthly pricing. The one huge thing that is a potential show-stopper for me is the 3-year contract that you have to sign to be able to have an iPhone in Canada. I don’t know what will happen in 3 years time, but I am 100% certain that I won’t have the same phone (iPhone 4.0 should be out by then). I would not mind paying more more for the phone now so that I don’t need to get locked in for such a long period of time. Digging further into the offering, I wanted to do the math behind cost for data usage, to get a better picture of what we are actually talking about… and the findings are quite interesting. All pricing below are in Canadian Dollars. In a nutshell, if you expect to transfer more than 2.1Gb per month and don’t use the iPhone as a phone a lot (under 150 minutes per month), go with the $60 plan, it’s cheaper! If you transfer 5Gb per month, it will cost you $229.80, $234.30, $251.08 and $235.36 on the $60, $75, $100 and $115 plans respectively. OK, we are about 3 weeks (my guesstimate) of knowing what will really happen with the iPhone 2, which is widely expected to be announced at the WWDC conference. Over the last few weeks, more and more mobile operators around the world have announced the upcoming availability of the cell phone from Apple on their network in many different countries (the iPhone blog has a good summary post). Looking as this list getting longer and longer almost every day, this can only mean one thing in my mind: the iPhone 2.0 will be unlocked. MacBook Air Multi-touch trackpad + airplane power = Interferences? Comfortably sitting on a 15+ hours Air Canada flight between Vancouver, Canada and Sydney, Australia, I was looking forward to experiencing my MacBook Air for a longer period of time. Good news, I got plenty of battery time (above 5 hours) with normal usage and with all wireless disabled. But after 5+ hours of usage, I needed to recharge the battery. Good news, there was a 110V power plug in the seat, so I connect my power adapter. And then, I get a huge surprise… the multi-touch trackpad starts behaving in a very strange way… the cursor starts jumping across the screen, when in the finder, the desktop icons change sizes… and as soon as I disconnect the power, everything is back to normal. I was therefore able to watch a movie on the Air, but every time I needed to move the cursor, I had to disconnect the power cord first??? I will try this again on my flight back, and if the problem is still there, I will report the details to Apple. It sounds really strange that a sub-notebook designed for road-warriors could have problems when used in a typical scenario for the target audience. My online AT&T GoPhone account tells me that I have International Roaming activated… so why doesn’t it work when I am in Canada? And why is it that when you call AT&T about this, they tell you that this option is not available on the iPhone GoPhone plan??? During a recent trip to the US, I got myself the new Portable Reader from Sony USA (looks like all the cool devices from Sony are not imported in Canada, just like the Mylo I reviewed previously) and have found it to be a very handy device, especially when you don’t want to carry more than one book with you. 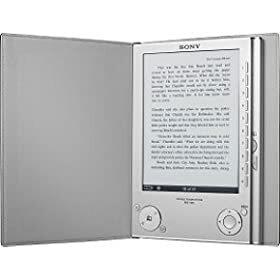 With all the noise about the Amazon Kindle these days (yet another device that won’t be available in Canada for the foreseeable future), I was really surprised by the bad press the eBook Reader from Sony was getting. Well, if Sony only sold a few thousands of these, I am one of the happy owners. Overall, the book reading experience is really nice, PDF support is bad and the Connect online bookstore has a long way to go before it can be at the same seamless experience level as iTunes. Yes, I know, i still have a AT&T activated (on GoPhone) locked iPhone. But yesterday, the port of ScummVM was announced for the iPhone. Getting Days of the Tentacle, Sam & Max or Indiana Jones and the Fate of Atlantis on the iPhone, now that’s an excellent reason to unlock and jailbreak my 1.1.2 iPhone. And then I would also be able to get a Rogers account and get back EDGE connectivity that I got hooked to last week while travelling in the US. Let’s see how long I can wait before having all these applications installed on my iPhone.